In many ways SE Qld is Australia’s garden centre, propagating and supplying landscapers and nurseries throughout SE Australia. Despite this, many good nursery businesses in this region are suffering during the drought. Lost custom and level 5 watering restrictions are putting reputable people out of work, and businesses are closing down. Imagine you’re a professional nursery grower. You grow good stock and you have a good, established reputation…and you’re managing to do reasonable business. What would be the ultimate turn off for your customers? 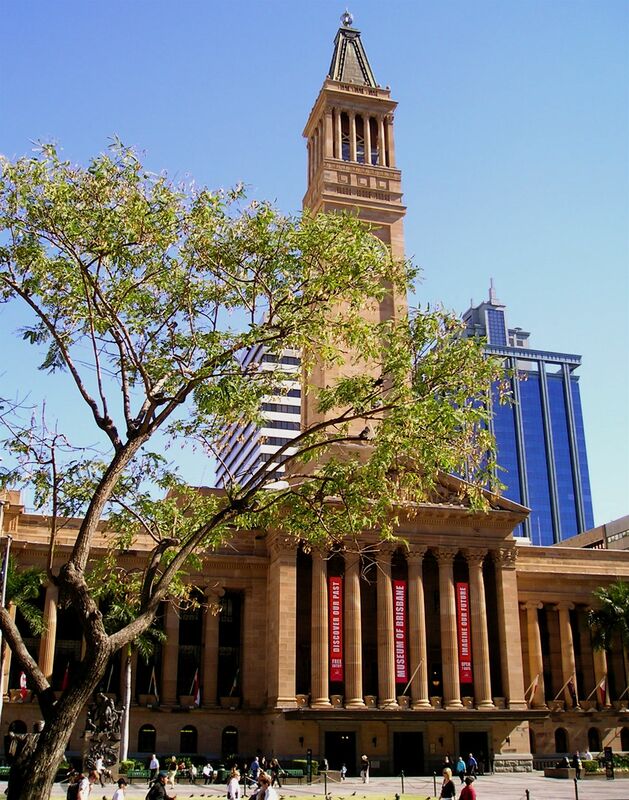 Brisbane town hall occupies a central position on the most valuable and frequently visited slice of the central business district. It’s a showpiece to international tourists, citizens and local gardeners. Last year our Premier announced a water state of emergency for SE Qld. Our Lord Mayor had a worthy idea – to create a waterwise garden in the square outside our town hall to encourage gardeners to save water whilst carrying on gardening. It’s an important message – an essential message – coming from Australia’s largest municipal council – save water, save jobs and keep our city green. Water restrictions and waterwise gardening are here to stay. 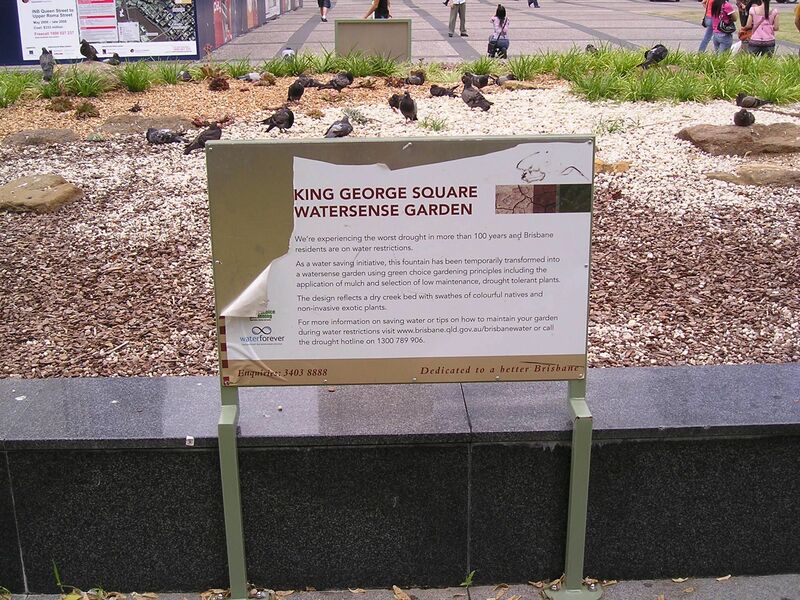 So the fountain was turned off and in went a freshly designed garden – The King George Square ‘Watersense Garden’. I know it’s called that because there are interpretive signs to tell me. “The design reflects a dry creek bed with swathes of colourful natives and non-invasive exotic plants” the peeling interpretive sign boasts evoking the look of flaking, sunburned skin. The square contains a few trees, but I don’t think the council knows they’re there or what messages they’re sending to gardeners. There grow semi-mature specimens of the Pride of Bolivia, Tipuana tipu (pictured), a weed of National Significance in Australia. Good to see our council practicing what it preaches. Perhaps they should be renamed the Pride of Campbell Newman. Fresh, healthy stock was planted in that new garden – a sprinkling of natives, just visible to the human eye, the occasional low-growing succulent and some fashionable, tufty Liriope and Mondo grass the council has learned survive abandonment. Almost. They’re browning off and thinning out as the drought continues. There’s mulch. After all, soil mustn’t be bare. If you squint you can almost, but not quite, totally forget that the white gravel alludes to that ‘dry creek bed’ look. Mulches occupy two thirds of the bed – greenery was never its central theme. In about a year the accumulating cigarette butts will have become the new surface mulch. 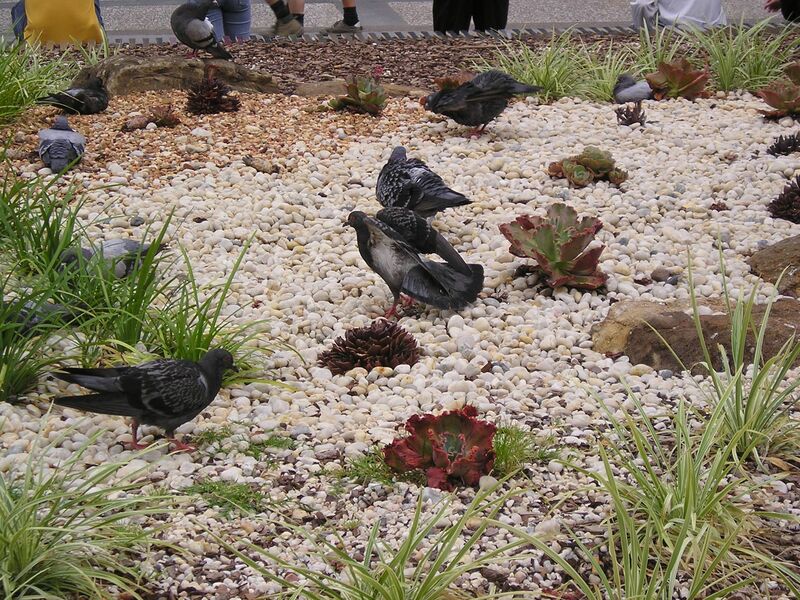 Pigeons are busily fertilising plants, signs, broken coping stones, splattering everything – with nitrogen-rich poo. A garden needs animals to bring it to life. “For tips on how to maintain your garden during water restrictions…call the drought hotline on 1300 789 906” the sign encourages. If you’ve the stomach, have a look at the King George Square ‘Watersense Garden’, Queensland’s ultimate anti-gardening garden. Concrete looks better by comparison.